This style of mercury reflector lamp was created for use in a special street lantern, developed for the East German market by VEB Leuchtenbau in Leipzig during the 1960's. Traditionally it is not realistic to employ mercury reflector lamps in streetlighting on account of the large dimensions of the reflector shape outer bulbs. 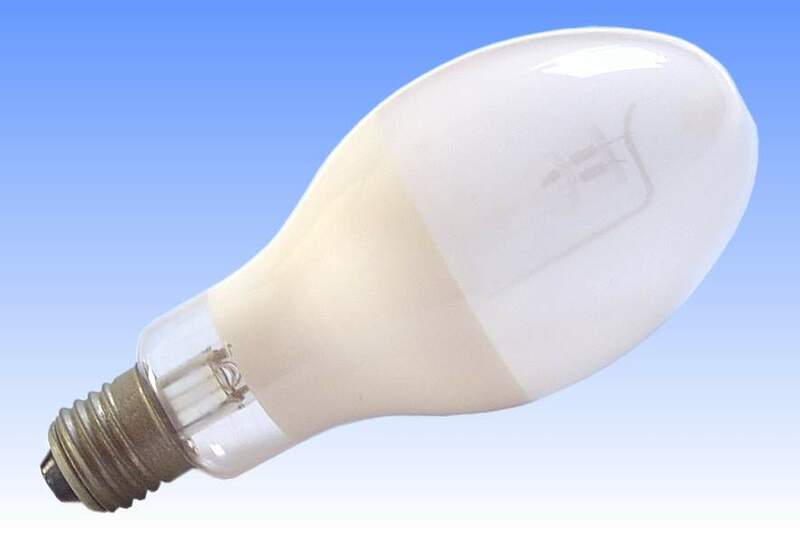 However the reflector lamps do offer certain technical advantages, in particular that the optical control is integrated within the lamp where it cannot deteriorate, it does not require periodic cleaning, and is renewed every time the lamp is replaced. This lamp was created in the same dimensions as a standard 125W mercury vapour product, employing the standard 75mm ellipsoidal E75 bulb type. The neck area is coated with a thick layer of titanium dioxide powder, a powerful white dye and efficient reflector of visible light. It is a diffuse reflector, scattering the light impinging on it to a certain degree, and thus preventing images of the arc tube being projected in the beam, instead the light from different parts of the arc tube is thoroughly homogenised. Over the top of this reflector is applied a thin layer of fluorescent phosphor. The layer is thinner than in standard lamps to prevent the reflected light being diffused too much, hence the degree of colour correction is not quite so good. The first lamp of this type was known as Narva's HQKRG 125W, employing the Goldweiß phosphor, magnesium fluoro-germanate. Around 1970 the nomenclature of Narva's lamps was changed and it became the Naviflux NF 125-22. 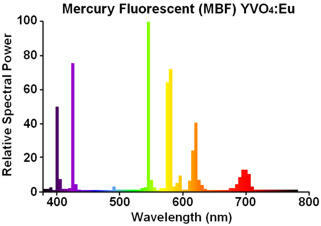 The version here is the last type made, the NF 125-21, employing yttrium vanadate as the fluorescent coating. References: 1) Narva Lampen - Strahler - Leuchten, 1974.